While Social Security disability payments can provide a disabled employee with a percentage of income, these benefits also come with strict guidelines. A disabled employee can wait up to a year to start receiving financial assistance. And Social Security denies a high percentage of workers applying for benefits. Did you know that income provided by a disability insurance policy is tax-free? "Individuals need to purchase disability income insurance to protect the life style they have created for themselves and their families." "I say this from a hard-learned personal experience," says Sam Statland. "When I was eight, my father had a stroke which left his left side paralyzed. Dad was a great guy, a self-made man who owned two men’s clothing stores, the income from which afforded us very comfortable life. Unfortunately, he did not purchase individual disability income (replacement) insurance before he became sick. He never worked another day, and his loss of income financially devastated our family." 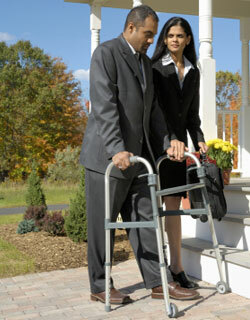 There are many different types of disability policies available from a wide range of companies. Call Statland and Katz at 301-587-6050 for a quotation today based upon your specific occupation and income requirements.